Most Christians who are interested in missions are aware that Christianity has grown dramatically in modern China, despite persecution by the Communist government. But the story of how Christianity grew and what it looks like today in China remains a mystery to most Western Christians. 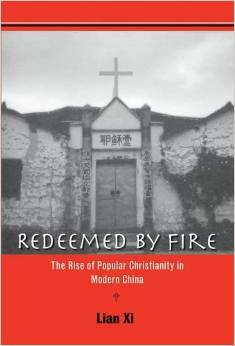 Lian Xi, a native of China who is now professor of history at Hanover College, lifted that mystery for Western readers in 2010 with his carefully researched book published by Yale University Press, Redeemed by Fire: The Rise of Popular Christianity in Modern China. Xi briefly surveys the presence of Christianity in China in ancient times, and then focuses most of the book on Christianity in China in the 19th and 20th centuries. China was forced to sign treaties with Western nations that included official toleration of Christianity after 1858. For the next century, over 23,000 missionaries poured into China from the West, half of them Americans. While this mission effort did contribute to over 623,000 members in mission churches by 1949, it also led to a deep resentment against Christians by most Chinese, who saw it as a religion of foreigners that was forced upon them. This resentment erupted into violence at times, such as the Boxer Rebellion. Xi stresses that Protestant Christianity was able to become truly indigenous under Communist rule, and no longer was seen as a foreign religion. The Communist government unwittingly allowed this to happen, by settting up the officially recognized and state-controlled Three-Self Church. Most Christians rejected the Three-Self Church as guilty of ungodly compromise with the state, and turned instead to a variety of underground church movements. Xi then follows the stories of several influential indigenous movements among Protestant Christians, including the True Jesus Church, the Bethel Band, the Jesus Family, and the Little Flock, with charismatic leaders like John Sung, Wang Mingdao, and Watchman Nee. Most of these churches held to a fundamentalist faith, a charismatic leader, pre-millennial hope, and a revivalistic, if not Pentecostal, fervor. Some half million Christians died under Communist persecution, but by 2000 there were 15 million Protestants and 5 million Catholics in the official registered churches, and an additional 30 million Protestants and several million Catholics in underground churches. Westerners tend to idealize the faith of Chinese Christians, but Xi points out that the lack of theological training and isolation from any accountability in underground churches occasionally led to doctrinal heresies and mixtures of Chinese folk religion with Christianity, as well as opening the door to leaders who were dictatorial and sometimes immoral. Despite these shortcomings among the underground churches, Xi credits them with having a powerful appeal by offering hope to the powerless under Communist oppression. Despite the phenomenal growth of Christianity in China, it is still a minority faith in China, and expected to remain a religion of the common people, not a majority faith or a faith of those in influence or power in China. I found Xi’s research to be thorough and highly informative, but it came across as somewhat aloof and skeptical of genuine faith. He tends to explain away the faith of Chinese Christians in terms of sociological factors. He includes stories of the moral failings of Chinese Christian leaders, but he reports very few of the stories of commitment, martyrdom and persecution suffered by Chinese Christians. Nevertheless, Xi’s research is likely to become a standard resource for any historian or missiologist wishing to understand Christianity in modern China. Language study can be difficult, but it’s vital to be accepted among the believers, and fit in. If the missionary isn’t accepted by the believers, he won’t be able to reach the unbelievers. Unfortunately, believers aren’t perfect, and can have conflict in churches on the mission field, just as churches here can have conflict. So pray for unity between the missionaries and the local believers. Dr. Cal Guy was a missions professor who was asked to preach a revival. Members were concerned about one man, “Fine Old Mr. Crenshaw,” who was known to be a fine man, but saw no need for Christ. The pastor took Dr. Guy to meet him, and said, “Mr. Crenshaw, I’ve been telling Dr. Guy what a fine man you are.” Dr. Guy retorted, “I don’t believe it. If you’re a man as I’m a man, then you’re a rotten sinner, headed to hell.” After a long pause, Mr. Crenshaw smiled and said, “You’re right. Let’s talk.” And he accepted Christ. Missionaries cannot be timid about sharing their faith. They need wisdom about when to be bold. The gospel can often be misunderstood. Hindus want to add Jesus to their other gods, and need to hear that Jesus is the only way. Muslims often think that when we say Jesus is the “Son” of God, that we are talking about a literal, crude sexual relationship between God the Father and Mary. So pray that missionaries will make the message clear in the culture where they serve. Persecution is very real in many places around the world. Missionaries have been expelled from countries on trumped-up charges. Pray for them to be rescued. Steven Gillum, IMB missionary in Curitiba, Brazil, prayed and prayed to discover an area of his city without a church, and then it was shown to him. Missionaries are always looking for unreached areas. Pray those doors will open for them to go in. William Carey labored in India for seven years without a single convert. One North American missionary befriended 60 families among an unreached people group, but has not yet seen one of them convert to faith. The work can be hard. Pray that they will be fruitful, as Carey was, when eventually God sent a revival. Today there are over a million Baptists in India who consider William Carey their spiritual forefather. Anytime you go to a different country, you may be exposed to different diseases. When I went on a short-term mission trip to Villa Berthet, Argentina, I noticed trees painted white halfway up, and certain markings on houses. When I asked what it meant, they said that it meant the “chagas” disease from an insect had infected those trees and houses. In Africa and Asia, missionaries often have to confront malaria, dengue fever, yellow fever, typhoid fever, cholera, and hepatitis A, among other diseases. Pray for their health. Missionaries serve in many different circumstances and different places around the world. Carlton Walker is a missionary reaching out to some of the 24 million senior adults in Japan. A retired man, Mr. S, takes Carlton around and introduces him to people, and he boldly shares his faith when people who have been Buddhist all of their lives. Pray for missionaries like Carlton Walker and others in the United States and around the world. There was a good crowd for the Country Carnival at First Baptist Church of Rincon. The youth from Colombes, France sang at the Country Carnival at First Baptist Church of Rincon. The French youth group sang at the Country Carnival at First Baptist Church of Rincon. This was an outdoor festival for families of the community at the church.